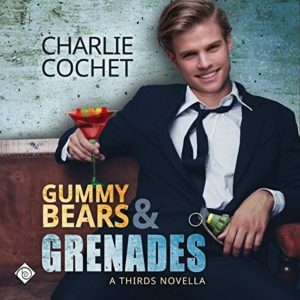 Gummy Bears & Grenades Cover reveal and Pre-Order! Hello, all! 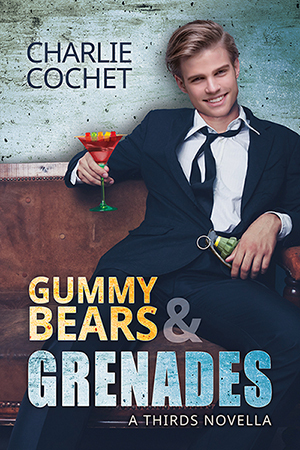 I'm over at The Novel Approach today sharing the cover for Gummy Bears & Grenades which goes up for pre-order at Dreamspinner Press today, along with the paperback combo of Gummy Bears & Grenades / Thick & Thin! To check out the cover, and enter the giveaway, hope on over to The Novel Approach! Get the Gummy Bears & Grenades eBook, or the Gummy Bears & Grenades / Thick & Thin Paperback combo for 30% off during Dreamspinner's Labour Day Sale September 4th - 8th!! Gummy Bears & Grenades Release Day! Hello, all! The boys are back and ready for a night on the town. Join Dexter J. Daley and crew for Dex's bachelor party. What could possibly go wrong? I think THIRDS readers know the answer to that. Filled with gummy bears, shenanigans, and smexy-times. Enjoy this bonus story from the THIRDS universe. These events occur between Darkest Hour Before Dawn and Tried & Truein the series timeline. While reading this story would enhance your experience of the THIRDS series, it is not necessary to read before Tried & True.